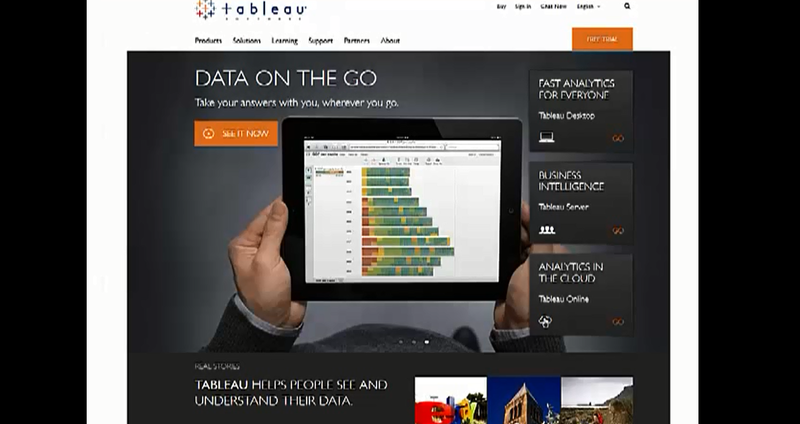 "Tableau Software helps people see and understand data. Tableau helps anyone quickly analyze, visualize and share information. More than 13,500 customer accounts get rapid results with Tableau in the office and on-the-go. And tens of thousands of people use Tableau Public to share data in their blogs and websites. See how Tableau can help you by deploying it from AWS Marketplace or downloading the free trial." "Amazon RDS gives you quick and easy access to MySQL, Oracle or Microsoft SQL Server relational databases in the cloud, while Tableau’s visual analytics software allows you to analyze your data no matter where it lives. Combining Amazon RDS with Tableau’s interactive analysis makes it possible for companies to easily manage and understand their data with low start-up costs and no big IT projects." "We make it easy for you to connect Tableau's rapid-fire business intelligence solution to Amazon RDS instances through our native MySQL, Oracle and Microsoft SQL Server connectors. Using the combined solution, you can get reporting and analytics necessary for running your business, create killer dashboards and cool visualizations, or perform Big Data analytics with just a few clicks." Available on a pay-as-you-go option to enable organizations to quickly deploy Tableau Server to any AWS region in minutes. Tableau’s user bundles for AWS Marketplace, available in 10, 25, 50, and 100 seat configurations, can be launched to run on optimally sized Amazon Elastic Compute Cloud (Amazon EC2) Instance types giving users flexibility based on the scope of their analytics project.